1 Rinse and halve the tomatoes. 3 Trim the mushrooms. Peel the onion, cut in half lengthwise and then cut into slices. Peel the garlic and cut into slices. 4 Sauté the onions and mushrooms in some olive oil. Add the garlic and tomatoes and cook for a few more minutes. 5 Sear the meat in clarified butter on each side for about 2 minutes. Season with salt and pepper. 6 Place the meat on 2 slices of toast. Distribute the vegetables on top and season with salt and pepper. 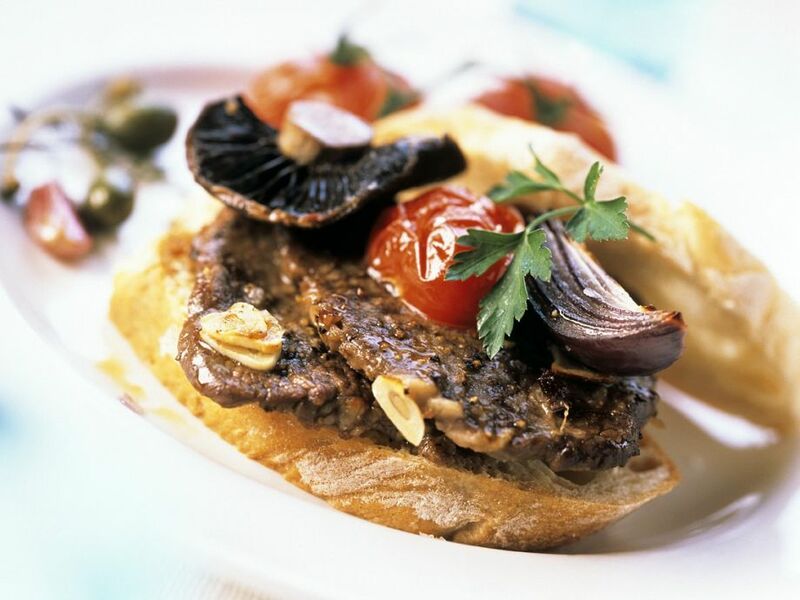 Drizzle with a few drops of balsamic vinegar and olive oil and place the remaining bread halves on top before serving.